"The Road Runner" redirects here. For other uses, see Road Runner (disambiguation). Wile E. Coyote (also known simply as "the Coyote") and the Road Runner are a duo of cartoon characters from the Looney Tunes and Merrie Melodies series of cartoons. In each episode, the Coyote repeatedly attempts to catch and subsequently eat the Road Runner, a fast-running ground bird, but is never successful. Instead of his animal instincts, the Coyote uses absurdly complex contraptions (sometimes in the manner of Rube Goldberg) to try to catch his prey, which comically "backfire", with the Coyote often getting injured in slapstick fashion. Many of the items for these contrivances are mail-ordered from a variety of companies that are all named Acme. One running gag involves the Coyote trying (in vain) to shield himself with a little parasol against a great falling boulder that is about to crush him. Another running gag involves the Coyote falling from a high cliff. After he goes over the edge, the rest of the scene, shot from a bird’s-eye view, shows him falling into a canyon so deep, that his figure is eventually lost to sight. This is followed, a second or two later, by the rising of a dust cloud from the canyon floor as the Coyote hits. The characters were created by animation director Chuck Jones and writer Michael Maltese in 1948 for Warner Bros., while the template for their adventures was the work of writer Michael Maltese. The characters star in a long-running series of theatrical cartoon shorts (the first 16 of which were written by Maltese) and occasional made-for-television cartoons. It was originally meant to parody chase cartoons like Tom and Jerry, but became popular in its own right. The Coyote appears separately as an occasional antagonist of Bugs Bunny in five shorts from 1952 to 1963: Operation: Rabbit, To Hare Is Human, Rabbit's Feat, Compressed Hare, and Hare-Breadth Hurry. While he is generally silent in the Coyote-Road Runner shorts, he speaks with a refined accent in these solo outings (except for Hare-Breadth Hurry), beginning with 1952's Operation: Rabbit, introducing himself as "Wile E. Coyote—Genius", voiced with an upper-class accent by Mel Blanc. The Road Runner vocalizes only with a signature sound, "Beep, Beep", recorded by Paul Julian (although some viewers claim it sounds more like "meep meep"), and an accompanying "popping-cork" tongue noise. To date, 49 cartoons have been made featuring these characters (including the four CGI shorts), the majority by Chuck Jones. TV Guide included Wile E. Coyote in its 2013 list of "The 60 Nastiest Villains of All Time". Jones based the Coyote on Mark Twain's book Roughing It, in which Twain described the coyote as "a long, slim, sick and sorry-looking skeleton" that is "a living, breathing allegory of Want. He is always hungry." Jones said he created the Coyote-Road Runner cartoons as a parody of traditional "Cat and mouse" cartoons such as MGM's Tom and Jerry, which Jones would work on as a director later in his career. Jones modelled the Coyote's appearance on fellow animator Ken Harris. The Coyote's name of Wile E. is a pun of the word "wily." The "E" stands for "Ethelbert" in one issue of a Looney Tunes comic book. The Coyote's surname is routinely pronounced with a long "e" (/kaɪˈoʊtiː/ ky-OH-tee), but in one cartoon short, To Hare Is Human, Wile E. is heard pronouncing it with a diphthong (/kaɪˈoʊteɪ/ ky-OH-tay). Early model sheets for the character prior to his initial appearance (in Fast and Furry-ous) identified him as "Don Coyote", a pun of the name Don Quixote. 49 shorts, mostly about 6 to 7 minutes long, but including three web cartoons which are "three-minute, three-dimensional cartoons in widescreen (scope)". One half-hour special, released theatrically (26 minutes). One feature-length film that combines live action and animation (91 minutes long). 5 August 14, 1954 (1954-08-14) Stop! Look! And Hasten! 7:00 Michael Maltese Charles M. Jones Bird Seed, Triple Strength Fortified Leg Muscle Vitamins "How to Build a Burmese Tiger Trap"
7 December 10, 1955 (1955-12-10) Guided Muscle 6:40 Michael Maltese Charles M. Jones ACME Grease "How to Tar and Feather a Roadrunner (10th printing)"
37 January 29, 1966 (1966-01-29) Out and Out Rout 6:00 Dale Hale Rudy Larriva No ACME labeled devices used. "Hunting Birds", "The History of Speed", "How to Sail"
45 November 1, 2003 (2003-11-01) The Whizzard of Ow 7:00 Chris Kelly Bret Haaland Book of Magic, Flying Broom, Bomb, Clear Paint "ACME Book of Magic"
1 Re-edited from Adventures of the Road-Runner, by Chuck Jones, and with new music direction from Bill Lava. 3 These cartoons were shown with a feature-length film. Chariots of Fur was shown with Richie Rich, Coyote Falls was shown with Cats & Dogs: The Revenge of Kitty Galore, Fur of Flying was shown with Legend of the Guardians: The Owls of Ga'Hoole, Rabid Rider was shown with Yogi Bear. Flash in the Pain was shown at the Annecy International Animated Film Festival on June 10, 2014. The desert scenery in the first three Road Runner cartoons, Fast and Furry-ous (1949), Beep, Beep (1952), and Going! Going! Gosh! (also 1952), were designed by Robert Gribbroek and was quite realistic. In most later cartoons the scenery was designed by Maurice Noble and was far more abstract. How the coyote acquires these products without money is not explained until the 2003 movie Looney Tunes: Back in Action, in which he is shown to be an employee of Acme. In a Tiny Toon Adventures episode, Wile E. makes mention of his protégé Calamity Coyote possessing an unlimited Acme credit card account, which might serve as another possible explanation. Wile E. being a "beta tester" for Acme has been another suggested explanation. Wile E. also uses war equipment such as cannons, rocket launchers, grenades, and bayonets which are "generic", i.e. not Acme products. In a Cartoon Network commercial promoting Looney Tunes, they ask the Coyote why he insists on purchasing products from the Acme Corporation when all previous contraptions have backfired on him, to which the Coyote responds with a wooden sign (right after another item blows up in his face): "Good line of Credit." In Whoa, Be-Gone!, after successfully avoiding being hit by his own rocket, the coyote is run over by an "ACME" truck emerging from a tunnel. The company name was likely chosen for its irony (acme means the highest point, as of achievement or development). Also, a company named ACME would have shown up in the first part of a telephone directory. Some people have said ACME comes from the common expansion A (or American) Company that Makes (or Making) Everything, a backronym of the word. The origin of the name might also be related to the Acme company that built a fine line of animation stands and optical printers; however, the most likely explanation is the Sears house brand called Acme that appeared in their ubiquitous early 1900s mail-order catalogues. In two Road Runner and Wile E. Coyote short films, Ajax was used instead of Acme Corporation. In some others, the names "A-1" and "Ace" and "Fleet-Foot" are used. In August, September and October 1982, the National Lampoon published a three part series chronicling the lawsuit Wile E. filed against the Acme Corporation over the faulty items they sold him in his pursuit of the Road Runner. Even though the Road Runner appeared as a witness for the plaintiff, the Coyote still lost the suit. "The Road Runner cannot harm the Coyote except by going "beep beep"." This rule was broken in Clippety Clobbered when the Road Runner drops a boulder on the Coyote after painting it with "invisible paint", and has been broken in several CGI shorts from The Looney Tunes Show. "No outside force can harm the Coyote—only his own ineptitude or the failure of the Acme products." Trains and trucks were the exceptions from time to time. "The Coyote could stop anytime—if he were not a fanatic. (Repeat: "A fanatic is one who redoubles his effort when he has forgotten his aim." —George Santayana)." "No dialogue ever, except "beep-beep!"" This rule was violated in some cartoons such as in Zoom at the Top where the Coyote says the word "Ouch!" after he gets hurt in a bear trap. "The Road Runner must stay on the road—otherwise, logically, he would not be called a Road Runner." This rule was broken in several shorts including cactus patches, mines, cliff edges, mountain tops and railways. "All action must be confined to the natural environment of the two characters—the southwest American desert." "All materials tools, weapons, or mechanical conveniences must be obtained from the Acme Corporation." Although in Rushing Roulette, the Coyote uses AJAX Stix-All glue. In Zip 'N Snort, aside from the ACME Iron Pellets, Wile E. also had a box of AJAX Bird Seed. In Fast and Furry-ous, even though one item, the Super Outfit, was from ACME, for some reason the Jet-Propelled Tennis Shoes was from "Fleet-Feet". "Whenever possible, make gravity the Coyote's greatest enemy." For example, falling off a cliff. "The Coyote is always more humiliated than harmed by his failures." These rules were not always followed. And in an interview years after the series was made, principal writer of the original 16 episodes Michael Maltese stated he had never heard of these or any "rules" and dismissed them as "post production observation". Animation vs. Reality Mixing: the Road Runner has the ability to enter the painted image of a cave, while the coyote cannot (unless there is an opening through which he can fall). Sometimes, however, this is reversed, and the Road Runner can burst through a painting of a broken bridge and continue on his way, while the Coyote will instead enter the painting and fall down the precipice of the cliff where the bridge is out. Gravity: sometimes the coyote is allowed to hang in midair until he realizes that he is about to plummet into a chasm (a process occasionally referred to elsewhere as Road-Runnering or a Wile E. Coyote moment). The coyote can overtake rocks (or cannons) which fall earlier than he does, and end up being squashed by them. 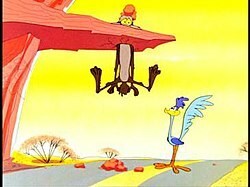 If a chase sequence runs over the edge of a cliff, the Road Runner is not affected by gravity, whereas the Coyote will be subject to normal earth gravity and eventually fall to the ground below. The Road Runner is able to run fast enough to go through time. If the Coyote uses an explosive (commonly dynamite) that is triggered by a mechanism that is supposed to force the explosive in a forward motion toward its target, the actual mechanism itself will shoot forward, leaving the explosive behind to detonate in the Coyote's face. Delayed Reaction: (a) a complex apparatus that is supposed to propel an object like a boulder or steel ball forward, or trigger a trap, will not work on the Road Runner, but always does so perfectly on the Coyote - when he inspects it after its failure to ensnare the Road Runner. (b) the Road Runner can jump up and down on the trigger of a large animal trap and eat the intended trap trigger bird seed off it and leave unharmed without setting off the trap; but when the Coyote places the tiniest droplet of oil on the trigger, the trap snaps shut on him without fail. On other occasions, the Coyote dons an exquisite Acme costume or propulsion device that briefly allows him to catch up to the Road Runner, but ultimately always results in him losing track of his proximity to large cliffs or walls, and while the Road Runner darts around an extremely sharp turn near a cliff defying physics, the Coyote succumbs to physics and will rocket right over the edge and plummet spectacularly to the ground. Both animals would also typically be introduced in a similar fashion; the action would slow to a halt, and a caption would appear with both their common name and a mock genus/species name in faux-Latin. For example, in "Zoom at the Top" Road Runner was classified as an example of "Disappearialis Quickius", while Coyote was identified as "Overconfidentii Vulgaris". The original Chuck Jones productions ended in 1963 after Jack L. Warner closed the Warner Bros. animation studio. War and Pieces, the last Road Runner short directed by Jones, was released in mid-1964. By that time, David DePatie and veteran director Friz Freleng had formed DePatie-Freleng Enterprises, moved into the facility just emptied by Warner, and signed a license with Warner Bros. to produce cartoons for the big studio to distribute. Their first cartoon to feature the Road Runner was The Wild Chase, directed by Freleng in 1965. The premise was a race between the bird and "the fastest mouse in all of Mexico," Speedy Gonzales, with the Coyote and Sylvester the Cat each trying to make a meal out of his usual target. Much of the material was animation rotoscoped from earlier Runner and Gonzales shorts, with the other characters added in. In total, DePatie-Freleng produced 14 Road Runner cartoons, two of which were directed by Robert McKimson (Rushing Roulette, 1965, and Sugar and Spies, 1966). Due to cuts in the number of frames used per second in animated features, many of these final Road Runner features were cheap looking and jerky. Also, the music was very different and of poorer quality than the older features (a byproduct of incoming music director Bill Lava, who replaced the suddenly deceased Milt Franklyn, retired Carl Stalling and whose style clashed noticeably with his predecessors). That was disappointing to fans of the original shorts, and many felt it was the final death knell for animation. The remaining eleven were subcontracted to Format Films and directed under ex-Warner Bros. animator Rudy Larriva. The "Larriva Eleven", as the series was later called, lacked the fast-paced action of the Chuck Jones originals and was poorly received by critics. In Of Mice and Magic, Leonard Maltin calls the series "witless in every sense of the word." In addition, except for the planet Earth scene at the tail end of "Highway Runnery", there was only one clip of the Coyote's fall to the ground, used over and over again. These cartoons can easily be distinguished from Chuck Jones' cartoons, because they feature the modern "Abstract WB" Looney Tunes opening and closing sequences, and they use the same music cues over and over again in the cartoons, also by Lava. Only one of those eleven cartoons—Run, Run, Sweet Road Runner—had music that was actually scored instead of the same music cues. Another clear clue is that Jones' previously described "laws" for the characters were not followed with any significant fidelity, nor were there Latin phrases used when introducing the characters. Wile E. Coyote has also unsuccessfully attempted to catch and eat Bugs Bunny in another series of cartoons. In these cartoons, the coyote takes on the guise of a self-described "super genius" and speaks with a smooth, generic upper-class accent provided by Mel Blanc. While he is incredibly intelligent, he is limited by technology and his own short-sighted arrogance, and is thus often easily outsmarted, a somewhat physical symbolism of "street smarts" besting "book smarts". In one short (Hare-Breadth Hurry, 1963), Bugs —with the help of "speed pills"—even stands in for Road Runner, who has "sprained a giblet" while "cornering a sharp coive the other day", and carries out the duties of outsmarting the hungry predator. This is the only Bugs Bunny/Wile E. Coyote short in which the coyote does not speak, and to use the Wile E. Coyote/Road Runner cartoon formula. As usual, Wile E. Coyote ends up falling down a canyon and fails to catch Bugs Bunny, much as the coyote always fails to catch and eat the Road Runner. In a later, made-for-TV short, which had a young Elmer Fudd chasing a young Bugs, Elmer also falls down a canyon. On the way down he is overtaken by Wile E. Coyote who shows a sign telling Elmer to get out of the way for someone who is more experienced in falling. In the 1962 pilot for a proposed television series (but instead released as a theatrical featurrette titled Adventures of the Road-Runner—when the project failed as a TV pilot, it was re-edited into To Beep or Not to Beep by Chuck Jones with additional new music by Bill Lava. But a few years later, the short was re-edited again into Zip Zip Hooray! and Road Runner a Go-Go, by DePatie-Freleng Enterprises). Jones' 1979 movie The Bugs Bunny/Road Runner Movie features many of Chuck's characters, including Wile E. and Road Runner. However, whereas most of the featured cartoons are single shorts or sometimes isolated clips, the footage of Wile E. and Road Runner is taken from several different cartoons and compiled to run as one extended sequence. 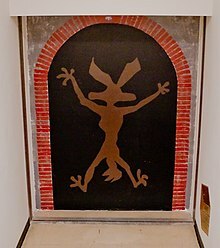 Wile E. and the Road Runner have two cameo roles in Robert Zemeckis' Who Framed Roger Rabbit first silhouetted when the elevator maneuvered by Droopy goes up, and then during the final scene in Marvin Acme's factory with several other studio characters. Wile E. and the Road Runner appear as members of the Tune Squad team in Space Jam. There, Wile E. rigs one of the basketball hoops with dynamite to prevent one of the Monstars from scoring a slam dunk. And during practice before Lola Bunny shows up, Wile E. gets his hands on a basketball, but the Road Runner steals the ball from him, and heads into a painted image. But Wile E. does not know it's a painted image, and he runs right into it. Wile E. appears as an employee of the Acme Corporation in Looney Tunes: Back in Action. There, his role is similar to that of Mustafa from the Austin Powers movies. Wile E. also makes a brief cameo in Tweety's High-Flying Adventure, being held by the neck by the Tasmanian Devil holding up a sign that says "Mother" before they both fall in the sea. Wile E. is an employee at Daffy Duck's store, in the film Bah, Humduck! A Looney Tunes Christmas. He is seen staring hungrily at a vending machine, but Daffy does not allow him to eat during work hours. The Road Runner also appears as a delivery boy. The two appeared in many different advertisements for Shell, Honey Nut Cheerios and Wile E. appears without the bird in adverts for the Energizer Bunny. In 2012, both Wile E. and Road Runner appeared in a GEICO commercial, in which the wandering gecko is lost. While he is doing so, he nearly gets crushed with an anvil, and then a piano. Just after this happens, Road Runner runs up to him, says his trademark phrase, "Beep beep!" and goes on his way. The gecko then gets confused about the Road Runner's catchphrase by saying "Meep, meep." Suddenly, Wile E., chasing the Road Runner, runs up, sees the gecko and imagines him as his dinner, but while doing so, is driven into the ground by a falling ACME safe. The commercial ends with the gecko concluding, "What a strange place." The Road Runner is the mascot for a brand of ice melt manufactured by Scotwood Industries. The Road Runner at one point was the mascot for Time Warner Cable Internet's Road Runner High Speed Online, during the period when both entities were under the AOL Time Warner corporate umbrella. After the companies broke up in 2009, Time Warner Cable continued to license the Road Runner name and iconography until the service was rebranded in 2012 as Time Warner Cable Internet. The two also appeared in the web cartoons "Wild King Dumb", "Judge Granny: Case 2" and "Wile E. Coyote Ugly" on looneytunes.com. Plymouth licensed the Road Runner's image for the Plymouth Road Runner muscle car. Several styles of decals featuring the Road Runner were put on the cars from 1968 to 1974. Chrysler's engineering department went to considerable trouble and expense to develop a car horn that made the classic "meep meep" sound of the Road Runner for the model. A "meep meep" horn is still available from aftermarket auto parts company J.C. Whitney. Wile E. appears as a defendant on the show Night Court and is subjected to a stern lecture by Judge Harold T. Stone, who tells him to "go to a restaurant, a supermarket, but leave that poor bird alone!" and finds Wile E. guilty of harassment. The two have also appeared in the National Australia Bank's "More Give, Less Take" advertising campaign in 2012. In another series of Warner Bros. Looney Tunes cartoons, Chuck Jones used the character design (model sheets and personality) of Wile E. Coyote as "Ralph Wolf". In this series, Ralph continually attempts to steal sheep from a flock being guarded by the eternally vigilant Sam Sheepdog. As with the Road Runner and Coyote series, Ralph Wolf uses all sorts of wild inventions and schemes to steal the sheep, but he is continually foiled by the sheepdog. In a move seen by many as a self-referential gag, Ralph Wolf continually tries to steal the sheep not because he is a fanatic (as Wile E. Coyote was), but because it is his job. In every cartoon, he and the sheepdog punch a timeclock, exchange pleasantries, go to work, take a lunch break, and clock out to go home for the day, all according to a factory-like blowing whistle. The most obvious difference between the coyote and the wolf, aside from their locales, is that Wile E. has a black nose and Ralph has a red nose. Wile E. was called Kelsey Coyote in his comic book debut, a Henery Hawk story in Looney Tunes and Merrie Melodies #91 (May 1949). He only made a couple of other appearances at this time and did not have his official name yet, as it wasn't used until 1951 (in Operation: Rabbit, his second appearance). The first appearance of the Road Runner in a comic book was in Bugs Bunny Vacation Funnies #8 (August 1958) published by Dell Comics. The feature is titled "Beep Beep the Road Runner" and the story "Desert Dessert". It presents itself as the first meeting between Beep Beep and Wile E. (whose mailbox reads "Wile E. Coyote, Inventor and Genius"), and introduces the Road Runner's wife, Matilda, and their three newly hatched sons (though Matilda would soon disappear from the comics). This story established the convention that the Road Runner family talked in rhyme, a convention that would also appear in early children's book adaptations of the cartoons. Dell initially published a dedicated "Beep Beep the Road Runner" comic as part of Four Color Comics #918, 1008, and 1046 before launching a separate series for the character numbered #4–14 (1960–1962), with the three try-out issues counted as the first three numbers. After a hiatus, Gold Key Comics took over the character with issues #1–88 (1966–1984). During the 1960s, the artwork was done by Pete Alvarado and Phil DeLara; from 1966–1969, the Gold Key issues consisted of Dell reprints. Afterward, new stories began to appear, initially drawn by Alvarado and De Lara before Jack Manning became the main artist for the title. New and reprinted Beep Beep stories also appeared in Golden Comics Digest and Gold Key's revival of Looney Tunes in the 1970s. During this period, Wile E.'s middle name was revealed to be "Ethelbert" in the story "The Greatest of E's" in issue #53 (cover-date September 1975) of Gold Key Comics' licensed comic book, Beep Beep the Road Runner. The Road Runner and Wile E. also make appearances in the DC Comics Looney Tunes title. Wile E. was able to speak in some of his appearances in the DC comics. In 2017, DC Comics featured a Looney Tunes and DC Comics crossovers that reimagined the characters in a darker style. Road Runner and Wile E. Coyote had a crossover with the bounty hunter Lobo in The Lobo/Road Runner Special. In this version, Road Runner, Wile E, and other Looney Tunes character are reimagined as standard animals who were experimented upon with alien DNA at Acme to transform them into their cartoon forms. In the backup story done in more traditional cartoon style, Lobo tries to hunt down Road Runner, but is limited by Bugs to be more kid-friendly in his language and approach. The Road Runner and the Coyote appeared on Saturday mornings as the stars of their own TV series, The Road Runner Show, from September 1966 to September 1968, on CBS. At this time it was merged with The Bugs Bunny Show to become The Bugs Bunny and Road Runner Show, running from 1968 to 1985. The show was later seen on ABC until 2000, and on Global until 2001. In the 1970s, Chuck Jones directed some Road Runner short films for the educational children's TV series The Electric Company. These short cartoons used the Coyote and the Road Runner to display words for children to read, but the cartoons themselves are a refreshing return to Jones' glory days. In 1979, Freeze Frame, in which Jones moved the chase from the desert to snow-covered mountains, was seen as part of Bugs Bunny's Looney Christmas Tales. At the end of Bugs Bunny's Portrait of the Artist as a Young Bunny (the initial sequence of Chuck Jones' TV special, Bugs Bunny's Bustin' Out All Over), Bugs mentions to the audience that he and Elmer may have been the first pair of characters to have chase scenes in these cartoons, but then a pint-sized baby Wile E. Coyote (wearing a diaper and holding a small knife and fork) runs right in front of Bugs, chasing a gold-colored, mostly unhatched (except for the tail, which is sticking out) Road Runner egg, which is running rapidly while some high-pitched "beep, beep" noises can be heard. This was followed by the full-fledged Runner/Coyote short, Soup or Sonic. Earlier in that story, while kid Elmer was falling from a cliff, Wile E. Coyote's adult self tells him to move over and leave falling to people who know how to do it and then he falls, followed by Elmer. In the 1980s, ABC began showing many Warner Bros. shorts, but in highly edited form. Many scenes integral to the stories were taken out, including scenes in which Wile E. Coyote landed at the bottom of the canyon after having fallen from a cliff, or had a boulder or anvil actually make contact with him. In almost all WB animated features, scenes where a character's face was burnt and black, some thought resembling blackface, were removed, as were animated characters smoking cigarettes. Some cigar smoking scenes were left in. The unedited versions of these shorts (with the exception of ones with blackface) were not seen again until Cartoon Network, and later Boomerang, began showing them again in the 1990s and early 2000s. Since the release of the WB library of cartoons on DVD, Boomerang has stopped showing the cartoons, presumably to increase sales of the DVDs. Wile E. and the Road Runner later appeared in several episodes of Tiny Toon Adventures. In this series, Wile E. Coyote (voiced in the Jim Reardon episode "Piece of Mind" by Joe Alaskey) was the dean of Acme Looniversity and the mentor of Calamity Coyote. The Road Runner's protégé in this series was Little Beeper. In the episode "Piece of Mind", Wile E. narrates the life story of Calamity while Calamity is falling from the top of a tall skyscraper. In the direct-to-video movie Tiny Toon Adventures: How I Spent My Vacation, the Road Runner finally gets a taste of humiliation by getting run over by a mail truck that "brakes for coyotes." The two were also seen in cameos in Animaniacs. They were together in two "Slappy Squirrel" cartoons: "Bumbie's Mom" and "Little Old Slappy from Pasadena". In the latter the Road Runner gets another taste of humiliation when he is outrun by Slappy's car, and holds up a sign saying "I quit"—immediately afterward, Buttons, who was launched into the air during a previous gag, lands squarely on top of him. 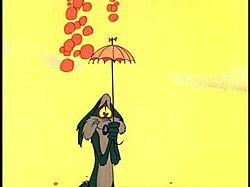 Wile E. appears without the bird in a The Wizard of Oz parody, dressed in his batsuit from one short, in a twister (tornado) funnel in "Buttons in Ows". Also, in the beginning of one episode, an artist is seen drawing Road Runner. Road Runner appears in an episode of the 1990 series Taz-Mania in which Taz grabs him by the leg & gets ready to eat him until the two gators are ready to capture Taz so he lets Road Runner go. In another episode of Taz-Mania the Road Runner cartoons are parodied with Taz dressed as Road Runner and the character Willy Wombat dressed as Wile E. Coyote. Willy tries to catch Taz with Acme Roller Skates but fails, and Taz even says "Beep, beep". Wile E. and Road Runner appeared in their toddler versions in Baby Looney Tunes, only in songs. However, they both had made a cameo in the episode, "Are We There Yet? ", where Road Runner was seen out the window of Floyd's car with Wile E. chasing him. Wile E. Coyote had a cameo as the true identity of an alien hunter (a parody of Predator) in the Duck Dodgers episode "K-9 Quarry," voiced by Dee Bradley Baker. In that episode, he was hunting Martian Commander X-2 and K-9. In Loonatics Unleashed, Wile E. Coyote and Roadrunner's 28th century descendants are Tech E. Coyote (voiced by Kevin Michael Richardson) and Rev Runner (voiced by Rob Paulsen). Tech E. Coyote was the tech expert of the Loonatics (influenced by the past cartoons with many of the machines ordered by Wile E. from Acme), and has magnetic hands and the ability to molecularly regenerate himself (influenced by the many times in which Wile E. painfully failed to capture Road Runner and then was shown to have miraculously recovered). Tech E. Coyote speaks, but does not have a British accent as Wile E. Coyote did. Rev Runner is also able to talk, though extremely rapidly, and can fly without the use of jet packs, which are used by other members of the Loonatics. He also has sonic speed, also a take off of Road Runner. The pair get on rather well, despite the number of gadgets Tech designs in order to stop Rev from talking; also they have their moments where they do not get along. When friendship is shown it is often only from Rev to Tech, not the other way around; this could, however, be attributed to the fact that Tech has only the barest minimum of social skills. They are both portrayed as smart, but Tech is the better inventor and at times Rev is shown doing stupid things. References to their ancestors' past are seen in the episode "Family Business" where the other Runners are wary of Tech and Tech relives the famous falling gags done in Coyote/Runner shorts. Road Runner and Wile E. feature in 3D computer animated cartoons or cartoon animation in Cartoon Network's new TV series The Looney Tunes Show. The CGI shorts were only included in season one, but Wile E. and Road Runner still appeared throughout the series in 2D animation. Wile E. Coyote also appears in the TV series Wabbit, voiced by JP Karliak, in a similar vein to his previous pairings with Bugs Bunny. He appears as Bugs' annoying, know-it-all neighbor who would always use his inventions to compete with Bugs. The Road Runner began making appearances when the series was renamed New Looney Tunes in 2017. The characters appeared in seven 3-D shorts attached to Warner Bros. features. Three have been screened with features, while the rest serve as segments in season 1 of The Looney Tunes Show. A short called Flash in the Pain was shown on the web in 2015, but was not shown in theaters. Warner Bros. is developing Coyote vs. Acme as a Wile E. Coyote movie with The Lego Batman Movie director Chris McKay on board to produce. Jon and Josh Silberman are set on writing the screenplay. Looney Tunes (Game Boy game by Sunsoft). The arcade game was originally to have been a laserdisc-based title incorporating footage from the actual Road Runner cartoons. Atari eventually decided that the format was too unreliable (laserdisc-based games required a great deal of maintenance) and switched it to more conventional raster-based hardware. Wile E. Coyote and Road Runner have been frequently referenced in popular culture. Wile E. Coyote has appeared twice in Family Guy: his first episode, "I Never Met the Dead Man", depicts him riding in a car with Peter Griffin; when Peter runs over the Road Runner and asks if he hit "that ostrich", Wile E. tells him to keep going. His second appearance was in "PTV", in which Wile E. attempts to get a refund for a life-sized slingshot at an ACME retailer where Peter works. Peter says that Wile E. cannot return the slingshot, but can get store credit. Wile E's wife then arrives and tells her husband to hurry up. Guitarist Mark Knopfler created a song called "Coyote" in homage to the cartoon shows of Wile E. Coyote and the Road Runner, on the 2002 album The Ragpicker's Dream. The Tom Smith song "Operation Desert Storm", which won a Pegasus award for Best Fool Song in 1999, is about the different crazy ways the Coyote's plans fail. Dee Snider, lead singer of the glam metal band Twisted Sister stated in his Congressional testimony before the PRMC hearings on adding Parental Advisory labels for what they deemed were increasingly offensive lyrics, imagery, violence and misogyny in music and music videos, that the music video for the band's signature song "We're Not Gonna Take It" was based heavily on the cartoon, specifically how the band's foil in the video, assuming the role of Wile E. Coyote, seems more or less unharmed in each successive scene, much as he does in the cartoon, despite whatever severe injury or accident befalls him, and bearing no resemblance to the lyrics of the song. Humorist Ian Frazier created the mock-legal prose piece "Coyote v. Acme", which is included in a book of the same name. ^ JP Karliak [@jpkarliak] (September 18, 2015). "The latest #Wabbit promo has a moment of me as Wile E. getting "winded." On #BoomerangTV next month! #SuperGenius" (Tweet) – via Twitter. ^ Flint, Peter (July 11, 1989). "Mel Blanc, Who Provided Voices For 3,000 Cartoons, Is Dead at 81". The New York Times. Retrieved December 1, 2007. ^ a b The interviews included in the DVD commentary were recorded by animation historian Michael Barrier for his book Hollywood Cartoons: American Animation in Its Golden Age. ^ Bretts, Bruce; Roush, Matt; (March 25, 2013). "Baddies to the Bone: The 60 nastiest villains of all time". TV Guide. pp. 14−15. ^ Collins, Glen (November 7, 1989). "Chuck Jones on Life and Daffy Duck". The New York Times. ^ Barrier, Michael (November 6, 2003). Hollywood Cartoons: American Animation in Its Golden Age. United States: Oxford University Press. p. 672. ISBN 978-0-19-516729-0. ^ Wroe, Nicholas (April 19, 2013). "Richard Williams: the master animator". The Guardian. Retrieved April 26, 2013. ^ a b "News from Me (column): "The Name Game" (Feb. 20, 2006), by Mark Evanier". Newsfromme.com. Archived from the original on March 4, 2007. Retrieved April 10, 2010. ^ Costello, E.O. "The Warner Brothers Cartoon Companion: Wile E. Coyote". Archived from the original on July 12, 2011. The original model sheet for the character bears a label referring to the character as “Don Coyote”, in reference to Miguel Ceverantes’ Don Quixote. ^ a b "blueguerilla.org :: View topic - Looney Tunes exclusive clip: Coyote Falls". Archived from the original on October 27, 2015. Retrieved December 16, 2014. ^ Maltin, Leonard (September 27, 2010). "Welcome back, Wile E." Leonard Maltin's Movie Crazy. ^ a b "FUR OF FLYING". Retrieved December 16, 2014. ^ a b Hopewell, John (June 9, 2014). "Studios, France, Emerging Industries Energize Annecy". Variety. Retrieved February 6, 2017. ^ a b "Reel FX Live from Annecy!". Reel FX. June 11, 2014. Archived from the original on June 24, 2014. Retrieved June 24, 2014. Peil wrapped up the presentation with the 6th installment in the series of Looney Tunes shorts “Flash in the Pain”. ^ "latinoreview.com". Retrieved December 16, 2014. ^ http://www.imao.us/index.php/2012/12/link-of-the-day-wile-e-coyote-sues-the-acme-company/. Retrieved August 4, 2017. ^ Jones, Chuck (1999). Chuck Amuck: The Life and Times Of An Animated Cartoonist. Farrar, Straus and Giroux. ISBN 978-0-374-52620-7. ^ "Home - Scotwood Industries". Scotwood Industries, Inc.
^ https://charleyconnolly.blogspot.com/2012/01/1974-plymouth-road-runner.html. Retrieved June 18, 2017. ^ Evanier, News from Me: "Mike Maltese had been occasionally writing the comics in semi-retirement before me, but when he dropped the 'semi' part, I got the job and that was one of the plots I came up with. For the record, the story was drawn by a terrific artist named Jack Manning, and Mr. Maltese complimented me on it. Still, I wouldn't take that as any official endorsement of the Coyote's middle name. If you want to say the Coyote's middle name is Ethelbert, fine. I mean, it's not like someone's going to suddenly whip out Wile E.'s actual birth certificate and yell, 'Aha! Here's incontrovertible proof!' But like I said, I never imagined anyone would take it as part of the official 'canon' of the character. If I had, I'd have said the 'E' stood for Evanier". ^ Sagers, Aaron (June 20, 2017). "Exclusive Preview: DC Comics' Lobo/Road Runner Special #1". Syfy. Retrieved July 2, 2017. ^ McNary, Dave (August 29, 2018). "Coyote vs. Acme Gives Wile E. Coyote His Own Looney Tunes Movie". ComingSoon.net. Retrieved August 29, 2018. ^ Pierson, Robin (August 7, 2009). "Episode 2: I Never Met The Dead Man". The TV Critic. Retrieved October 23, 2011. ^ "The FuMP: Operation: Desert Storm by Tom Smith". Retrieved December 16, 2014. ^ "Video of Dee Snider's 1985 testimony before the PMRC". Retrieved April 11, 2019. ^ Frazier, Ian, "Coyote v. Acme", The New Yorker, February 26, 1990, p. 42. Wile E. Coyote at Don Markstein's Toonopedia. Archived from the original on January 19, 2017. Road Runner at Don Markstein's Toonopedia. Archived from the original on January 19, 2017. This page was last edited on 18 April 2019, at 15:06 (UTC).